I love picking up bargains at charity shops and this little stool was one of them. 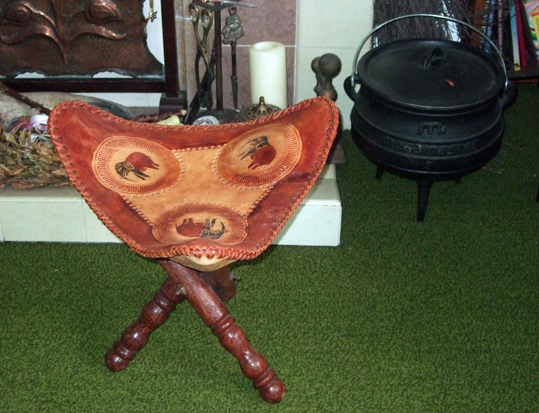 Sadly, some of my bargains turn out to be not that useful - and this little stool was one of them too. I had thought it would be a useful extra seat for when there are several witches joining me for some tea and magic. No one ever wanted to sit on it though. It is wobbly and not very comfortable. The good news is that today it is moving on to a new home. A friend who has a bad leg came round to visit on my birthday last weekend. They discovered it makes a good footstool. So, this afternoon I am taking it over to their house. I am also planning to do some more decluttering of my witch room to move out other things I no longer need and make room for new bargains.